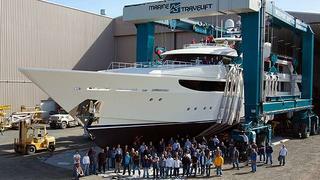 Westport announces the launch of its 11th hull in the successful Westport 164 superyacht series. She's the fourth launch for the American yard this year of the 11 launches scheduled in 2013. Currently known under the hull number 5011, she’s part of this 50-metre semi-custom series designed by Donald Starkey with naval architecture by the duo of Garden/Olson. In the standard version, the Westport 164 accommodates 12 guests in six cabins: a master suite on the main deck, a VIP on the bridge deck and two doubles and two twins on the lower deck. Powered by twin 3,650hp MTU engines, she achieves a top speed of 24 knots, a cruising speed of 20 knots and a range of 5,200 nautical miles at 12 knots. Phil Purcell, Vice President of Westport, concluded: 'We are very proud to be delivering this 50-metre to a client that owned a previous Westport build'. As a reminder, here are the other members of the Westport 164 series since its launch in 2006: Vango (hull 5001), Evviva (hull 5002), My Girl (hull 5003), Seaquest (hull 5004), Xilonen V (hull 5005), Harmony (hull 5006), Boardwalk (hull 5007), Wabi Sabi (hull 5008) Legacy (hull 5009) and Annastar (hull 5010).